211 Bernard: Where Art Belongs - New Chris Kraus! 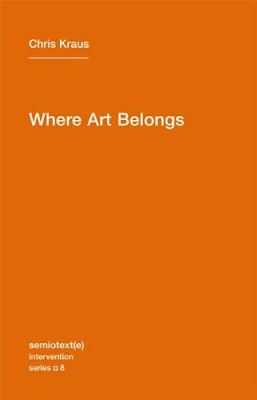 Where Art Belongs - New Chris Kraus! Sorry yall's, the book got here last week but the staff bought all the copies we had within the first 24 hours... But we got our fix now, so the second shipment of this fascinating book is all yours! Kraus' latest book is comprised of four essays in which stories of art and people evoke the alternatives and the freedom the art world can or could offer beyond its flaws.